We Mutha Plastic Industries Manufacturer of Plastic Pails, Plastic Grease Cartridges, Tubes & Adhesive Packaging. We manufacture EMPTY HDPE CARTRIDGE for Silicone Sealant packaging. We have high precision moulds and International level standard quality. 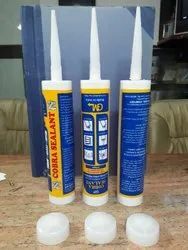 This Plastic silicone sealant Cartridge is made out of polypropylene. It consists of three basic parts – the cartridge itself, a Plunger Nozzle. The standard – sized, injection moulded cartridge has uniform wall thickness.